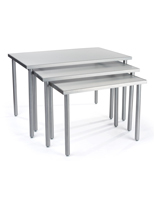 Tables come in a set of (2) for large displays. White melamine MDF is 3/4” thick for a durable, yet affordable unit. 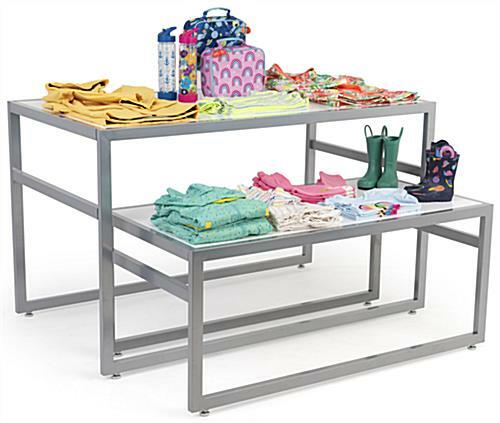 Steel frame with a powder coated silver finish for coordinating with any décor. (4) Adjustable feet for stabilizing unit even on slightly uneven surfaces. 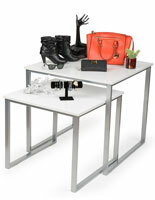 These white nesting tables, also known as retail sets, are the ideal way to present merchandise in stores. Each counter is an easy way to promote various items in retail stores. These white nesting tables that have a large countertop are made for showing off a wide selection of products. Each furniture display comes in sets of (2) fixtures. 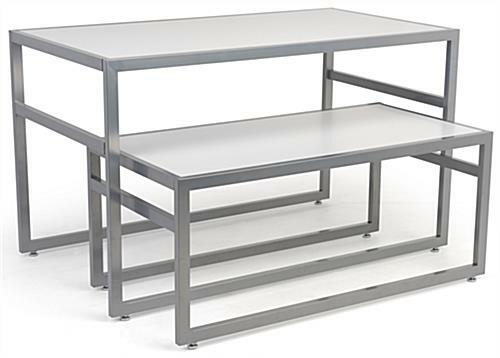 These white nesting tables largest countertop display is 55”w x 32-3/4”h. The smaller unit is designed to easily fit under the larger one to create a cascading design. 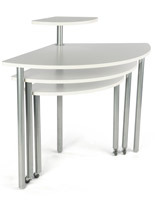 These white nesting tables also have a smaller furniture holder of 48”w x 21”h. This merchandising display easily fits stacks of clothing on either surface. 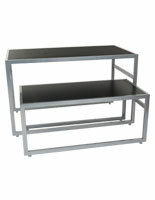 These merchandising furniture units, white nesting tables have 10-5/8” clearance between the top and bottom shelves. The retail display comes with a semi-gloss MDF top to coordinate with most store environments. 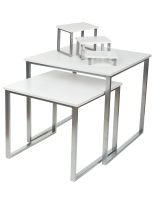 These white nesting tables that are constructed with a steel frame are meant for lasting use! Each steel frame has a silver powder coated finish for a sleek design. 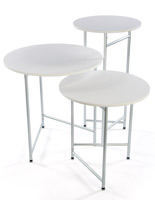 These white nesting tables that are made of 3/4” MDF will support a generous amount of merchandise on the tabletops. This merchandise furniture takes just minutes to put together. These white nesting tables are ready to assemble right out of the box. Each retail display has (4) feet for adjusting the fixture and stabilizing on most surfaces.